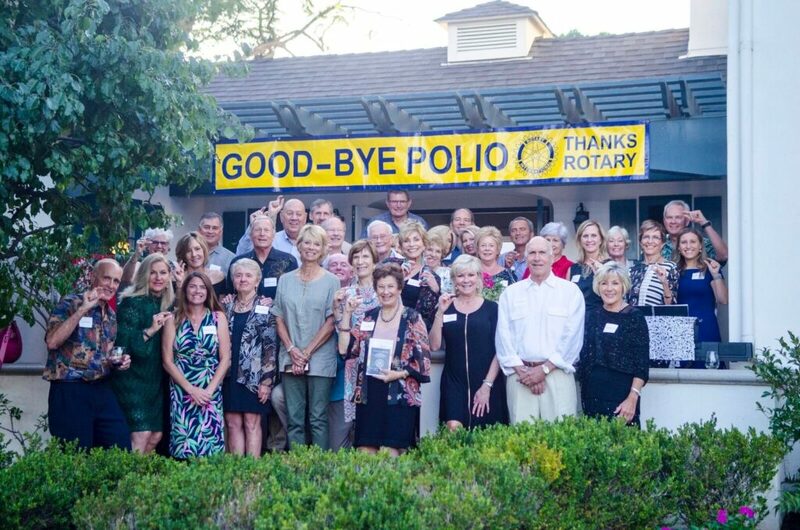 Coronado Rotary hosted its 10th annual “End Polio Now” Wine Tasting Fundraiser on October 5th. About 150 Rotarians and guests gathered in the welcoming garden at Jim Kaufman’s home for a party with a very vital purpose, the worldwide eradication of polio. Generous donations for special events, such as an afternoon sailing on the bay, a paella dinner in the home of the buyer, an evening of music, art, champagne and hors d’oeuvres, and more were auctioned off, both live and silently. Proceeds from the event, chaired by Pat Flynn and Sue Maack, raised $70,000. The donations will go to support Rotary International’s Global Polio Eradication Initiative and will include funds that will be tripled by the Bill and Melinda Gates Foundation. On October 24th, Rotarians mark World Polio Day. It is a day to celebrate how far we have come – from an estimated 350,000 cases of polio per year down to just a few in 2018. But to achieve eradication, we must reach zero cases, and stay at zero world-wide for three consecutive years. In 2017, Rotary and its partners worked to reach 430 million children in 39 countries during polio immunization campaigns. Unless we completely eradicate polio, within 10 years we could see as many as 200,000 new cases each year, all over the world. The disease is endemic in only 3 countries, but unless we reach every child with the vaccine, no child anywhere is safe. If you would also like to make a donation to End Polio now, please email Jaimie Centeno, Executive Director at coronadorotary@sbcglobal.net.